Also interested in Bazooka Joe, Monster Initials, Creature Feature '73 and probably a few others, but Gold Rush definitely "topps" my list, haha. Also Garbage Can-dy, Munchie Mummies and various vintage Bazooka boxes are of interest. Jason once posted a vintage Topps sales flyer from circa 1975, and several of the boxes I'm mentioning are featured there. That seller has a few of the Grape boxes. The first one he sold last month went for $1,000 (the next one he listed went for less - I want to say $500, maybe the third went for $300?) ... and considering it's the first full display box of any Gold Rush I've ever seen, I thought that was quite reasonable. Not as much as the seller has more of the same.. but still an extraordinary piece for someone like myself to see. I think you've got a good shot at picking up things like trading card/sticker boxes as people actually saved/collected those, and probably even a Bazooka box. Bazooka boxes show up somewhat regularly, though if you're specifically looking for a 1970's one, that might be tougher (60's boxes seem to surface more often). The other material, the candy/bubblegum stuff is going to be exceedingly difficult to uncover. In my decade + of collecting candy/bubblegum material, I cannot recall more than a few Gold Rush display boxes (scored and folded/used) that have ever come up for sale... maybe three or four? I think I saw a 1980's one pop up early last year. I have a good number of Gold Rush display box flats and proofs that I've purchased over the years, representing a few different eras (and box/packaging designs) of Gold Rush, and even a 1970's UK Topps/Trebor Gold Rush display box proof - which is amazing. In fact, I have more Gold Rush display box flats or proofs than I do actual scored-and-folded display boxes. The most unusual piece I have for this brand might be a scored-and-folded display box for Gold Rush Raspberry, which was out in the late 1960's - a short-lived, oddball flavor extension for the brand. The thing you might be able to find would be some of the slightly beat-up printers flats which was a big find from 20+ years ago. Those are unscored and sometimes roughly cut display box flats, which included things like Gold Rush, Munchy Mummy and Garbage Can-dy. Some don't contain all the printed colors, but the ones I have for those brands did - they're awesome. So those are out there in some number, though I haven't seen them show up for sale like they used to for some time. That's the most likely place you might find them, historically speaking. Still, like this unusual find of full Gold Rush display boxes that started going onto ebay last month, a new find could surface. Which would be pretty fun! Topps' 1974 Lineup! For Fun and Profit! Monster Initials box should be easy. A lot of unopened material for Monster Initials has been around in the last decade, I think I paid maybe $30 for mine. Thanks for the feedback guys. The seller currently listing the full grape boxes was one of the reasons I raised this question now. I'm not that interested in the full bag contents, or at least the price tag associated with it, and wondered what else might be out there in terms of buying options. One of the sucky things about eBay is that once a single bid is placed, the number of watchers is no longer shown, so you have no idea if a bidding frenzy is going to happen in the closing seconds of the auction, or if that bidder is the only other person interested in the item. I've seen both scenarios many times. As for the various box flats or proofs, I've seen them on eBay over the years, but they seem to be earlier versions from maybe late 60's. Those are attractive too, but very pricey. I guess I find the "kids" version of the 70's more desirable from a Wacky-era perspective, and hoped that they'd be more available. Glad to help anyway I can. I certainly understand the appeal of this material. Nice! Quite a history to the Gold Rush product. 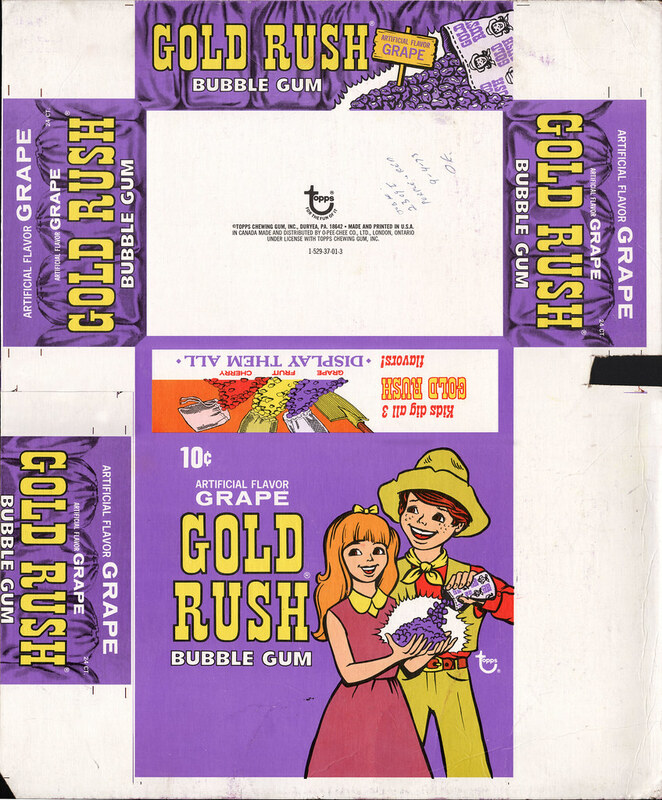 There's some modern-day equivalent of this type of gum - Bag 'o Rocks or something like that, but it doesn't taste like I remember Gold Rush from back in the day. Tastes a lot more artificial now, for lack of a better word. Thanks for the insight. I'll keep searching for sure. 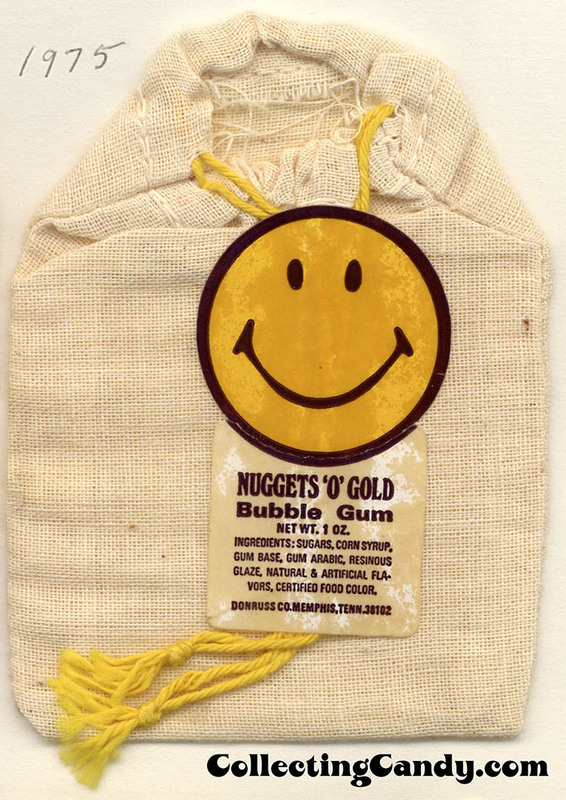 Into the 80's when Topps started producing the plastic Gold Rush bags, that's when they really expanded how they used that nugget gum format, producing Superman Krypton nuggets, Smurf Rocks, Labyrinth rocks, Santa coal, He-Man Rocks... they really squeezed a lot out of it. 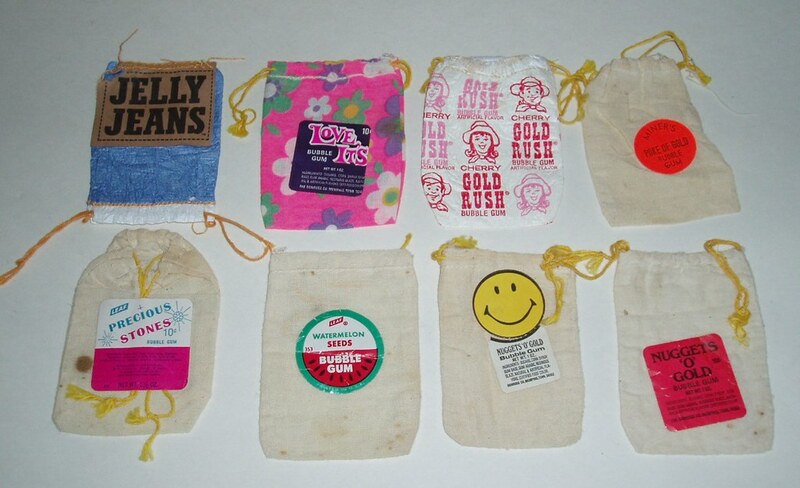 They also produced a few different versions of Gold Rush in those plastic pouches... you can only see one version in the following photo of mine, but there was also a plastic version that used the kid design from the classic fabric pouch (just printed on plastic) as well as a denim jeans inspired version and one with a pot-of-gold type of graphic... all branded Gold Rush. I should also note that in the late 60's, before the kids were added to the pouches, I believe they were pretty much plain, but I do know that for Christmas at least one year the plain fabric pouches got some kind of Christmas Gold Rush sticker on them - though I've never seen an actual example of one of those... only a very hazy photo. Thanks for mentioning this. I had no idea that more product had surfaced, and impact on pricing. I tried hard for a box years ago, and couldn't get sellers to budge from high asking prices. Now, a week later, I am the proud recipient of a decent box plus a few wrappers for the tidy sum of $21 (via eBay of course). Great! That's pretty much the only other sticker set I remember purchasing during the wacky era. Those images conjure up a lot of memories! My experience came later for some reason. I know they were originally issued in 1974, but I have no recollection of ever seeing them at that time. A new candy store opened in the neighborhood in the summertime. It was either 1977 or 78. That was the only place I ever saw them. I remember it well because I bought quite a few packs with a friend from school, who I only became acquainted with around that time. We killed ourselves to try and get that last puzzle piece. I must have had something close to a complete set of stickers, but of course I stuck them, cut the cards in half to separate the letters, and any other form of childhood card collecting blasphemy I could think of.